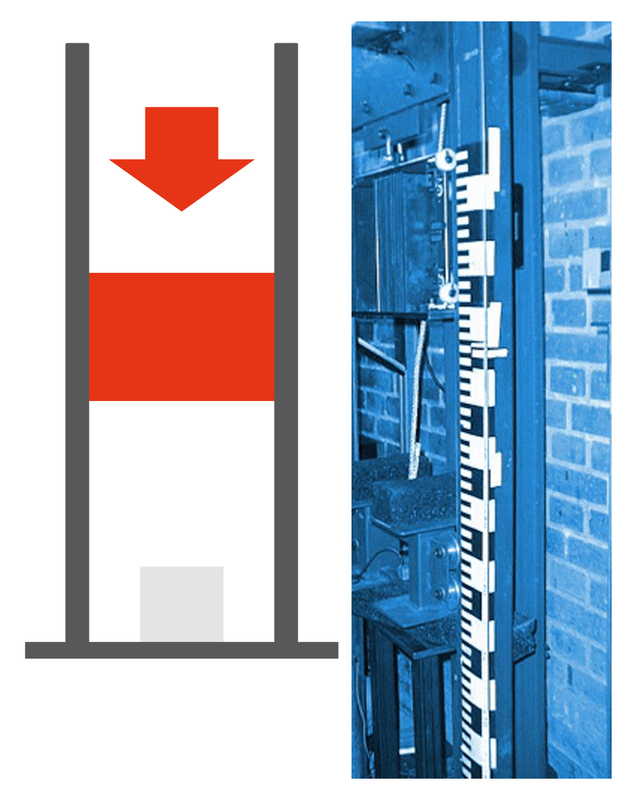 Drop tower tests can be performed at the testing area of our cooperation partner Berlin Technical University. In a former lift shaft, tracks are mounted, where different impactors can be guided. At a pair of rails, a drop frame ist guided. At this drop frame, the impactor is fixed by slopes. After contact of impactor to the specimen, the drop frame will be decelerated by hydraulic absorbers. The length of the slopes will be adjusted, so that the impact to the specimen is finished before decelerate the drop frame. Impact velocity is measured by light barriers, which leads to very accurate results. Maximum drop mass is dependend from drop height and from energy absorption of specimen. The length of the tracks is about 16m, which means a theoretical impact velocity of 17.7 m/s. Maximum impactor mass is 50 kg.